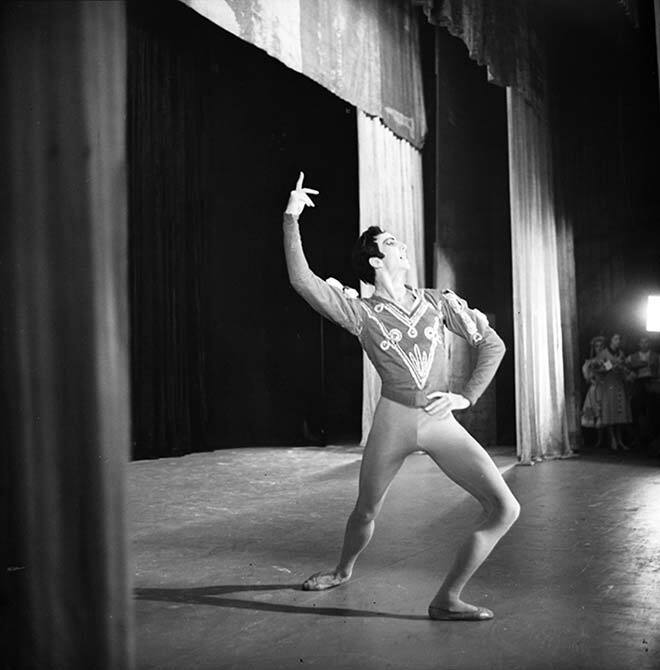 Ballet dancer Bryan Ashbridge performs during a tour of New Zealand in 1957. Ashbridge was born in Wellington in 1924 and educated at Auckland Grammar School, where he excelled at sport. He began learning ballet at the age of nine and, while a schoolboy, trained and danced in Australia. After joining the Royal New Zealand Air Force he continued his dancing, and in 1946 went to England to further his studies. At Sadler's Wells Ballet School he won a gold medal and then joined the Sadler's Wells Ballet (renamed the Royal Ballet in 1956), becoming a soloist and then, in 1957, a principal, renowned for his athletic style. In the 1950s and 1960s he and other Royal Ballet dancers toured New Zealand and Australia several times, and he was also a guest artist with the Bolshoi Ballet in Moscow. After his retirement from the Royal Ballet in 1965, he became a television producer of ballet and other programmes for the BBC in the UK, the New Zealand Broadcasting Corporation and the Australian Broadcasting Corporation. He also directed the Australian Ballet Company (and briefly the Royal New Zealand Ballet Company). He spent his last years in Australia and died in Melbourne in 1995.